Average June ice extent was the lowest in the satellite data record, from 1979 to 2010. Arctic air temperatures were higher than normal, and Arctic sea ice continued to decline at a fast pace. June saw the return of the Arctic dipole anomaly, an atmospheric pressure pattern that contributed to the record sea ice loss in 2007. Arctic sea ice extent averaged 10.87 million square kilometers (4.20 million square miles) for the month of June, 1.29 million square kilometers (498,000 square miles) below the 1979 to 2000 average and 190,000 square kilometers (73,000 square miles) below the previous record low for the month of 11.06 million square kilometers (4.27 million square miles), set in 2006. In June, ice extent declined by 88,000 square kilometers (34,000 square miles) per day, more than 50% greater than the average rate of 53,000 square kilometers (20,000 square miles) per day. This rate of decline is the fastest measured for June. During June, ice extent was below average everywhere except in the East Greenland Sea, where it was near average. At the end of May 2010, daily ice extent fell below the previous record low for May, recorded in 2006, and during June continued to track at record low levels. By the 30th of June, the extent was 510,000 square kilometers (197,000 square miles) below the same day in 2006. Weather conditions, atmospheric patterns, and cloud cover over the next month will play a major role in determining whether the 2010 sea ice decline tracks at a level similar to 2007, or more like 2006. Although ice extent was greater in June 2007 than June 2006, in July 2007 the ice loss rate accelerated. That fast decline led up to the record low ice extent of September 2007. However, it would not be surprising to see the rate of ice loss slow in coming weeks as the melt process starts to encounter thicker, second and third year ice in the central Arctic Ocean. Loss of ice has already slowed in the Beaufort and Chukchi Seas due to the tongue of thicker, older ice in the region noted in our April update. Average ice extent for June 2010 was190,000 square kilometers (73,000 square miles) less than the previous record low for June, observed in 2006; 620,000 square kilometers (240,000 square miles) below that observed in 2007; and 1.29 million square kilometers (498,000 square miles) below the average extent for the month. The linear rate of monthly decline for June over the 1979 to 2010 period is now 3.5% per decade. This year’s daily June rate of decline was the fastest in the satellite record; the previous record for the fastest rate of June decline was set in 1999. This rapid decline was in part driven by ice loss in Hudson Bay. Ron Kwok of the Jet Propulsion Laboratory (JPL) reports that Nares Strait, the narrow passageway between northwest Greenland and Ellesmere Island is clear of the ice “arch” that usually plugs southward transport of the old, thick ice in the Lincoln Sea. Typically the ice arch forms in winter and breaks up in early July. This year the arch formed around March 15th and lasted only 56 days, breaking up in May. In 2007 the ice arch did not form at all, allowing twice as much export through Nares Strait than the annual mean. Although the export of sea ice out of the Arctic Ocean through Nares Strait is very small in comparison to the export through Fram Strait, the Lincoln Sea contains some of the Arctic’s thickest ice. For the ice flux rates out of Nares strait, see Figure 5a. While recent studies have shown that wintertime Antarctic sea ice has a weak upward trend, and substantial variability both within a year and from year to year, the differences between Arctic and Antarctic sea ice trends are not unexpected. Climate models consistently project that the Arctic will warm more quickly than the Antarctic, largely due to the strong climate feedbacks in the Arctic. Warming is amplified by the loss of ice cover in the Arctic Ocean in areas that had been ice-covered for decades, and by the warming of Arctic lands as snow cover is lost earlier and returns later than in recent decades. Moreover, rising levels of greenhouse gases and the loss of stratospheric ozone appear to be affecting wind patterns around Antarctica. Shifts in this circulation are referred to as the Antarctic Oscillation (AAO). As greenhouse gases have increased, and especially when ozone is lost in spring, there is a tendency for these winds to strengthen (a positive AAO index). The net effect is to push sea ice eastward, and northward, increasing the ice extent. As the current sea ice anomaly has developed, the AAO index has been strongly positive. See the NOAA AAO Index Web site. 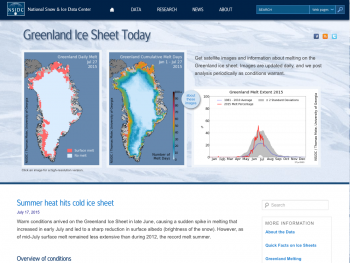 For more information about the differences between sea ice dynamics in the Arctic and Antarctic, see the NSIDC All About Sea Ice Web site. Arblaster, J. M., and G. A. Meehl. 2006. Contributions of External Forcings to Southern Annular Mode Trends. Journal of Climate, 19: 2896-2905. Hall, A., and M. Visbeck. 2002. Synchronous Variability in the Southern Hemisphere Atmosphere, Sea Ice, and Ocean Resulting from the Annular Mode. Journal of Climate, 15: 3047-3053. Kwok, R., L. Toudal Pedersen, P. Gudmandsen, and S. S. Pang. 2010. Large sea ice outflow into the Nares Strait in 2007. Geophys. Res. Lett., 37, L03502, doi:10.1029/2009GL041872. Wang, J., J. Zhang, E. Watanabe, M. Ikeda, K. Mizobata, J. E. Walsh, X. Bai, and B. Wu. 2009. 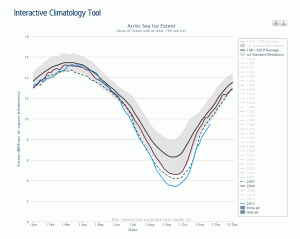 Is the Dipole Anomaly a major driver to record lows in Arctic summer sea ice extent? Geophys. Res. Lett., 36, L05706, doi:10.1029/2008GL036706.